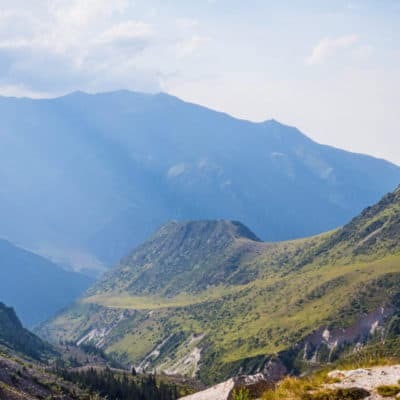 In this article, you’ll find a list of the most popular hikes near Almaty, how to get there and what to bring. When we first arrived in Kazakhstan, we were expecting it to be a flat barren desert in its entirety. But when we traveled to the southwestern part of the country, we were surprised to see huge green mountains spring forward. The Almaty region of Kazakhstan is located right at the foot of the Tian Shan mountains, making it a prime location for hiking enthusiasts. 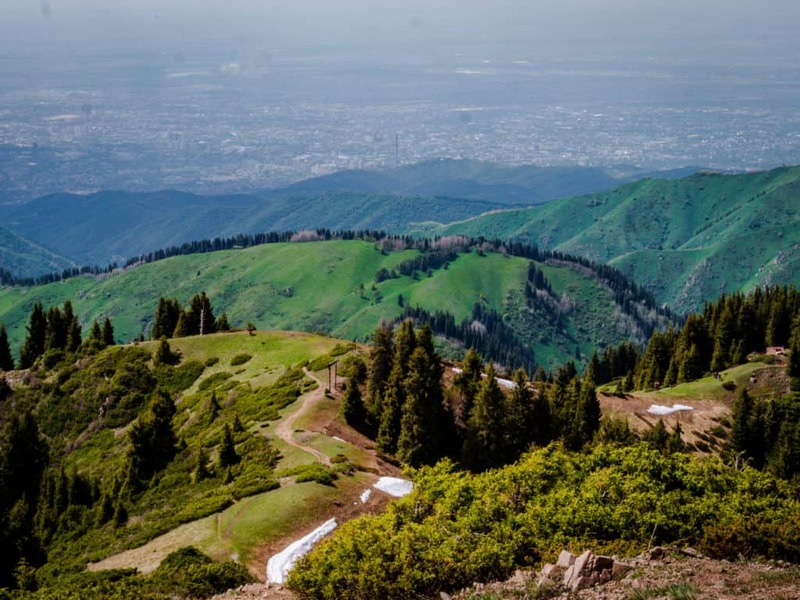 There are plenty of interesting day hikes from Almaty (the country’s old capital) in which you can reach beautiful valleys, gorges, and mountain peaks. 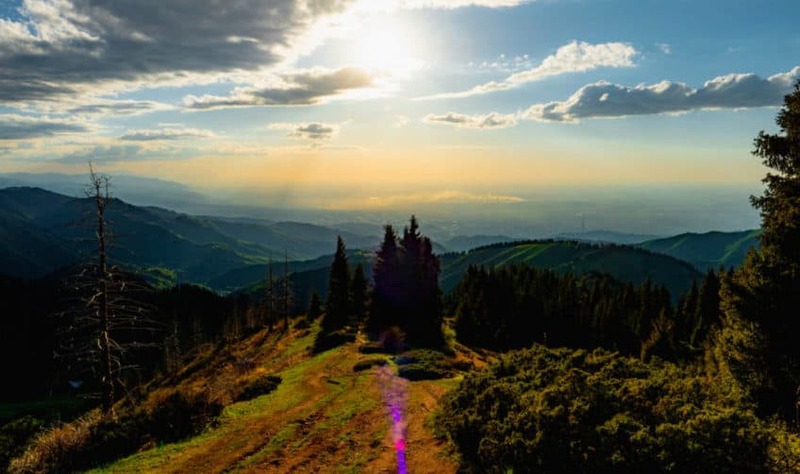 Keep on reading as we’ll share with you the best hiking trails near Almaty. This post contains affiliate links. If you make purchases through one of the links in this post, we get a small commission at no extra costs for you. This will help us with the continuation of our journey so we can write more useful articles like this one. Getting to Almaty is very easy. If you are coming from Bishkek (Kyrgyzstan), it is about a five-hour journey and extremely cheap and easy. 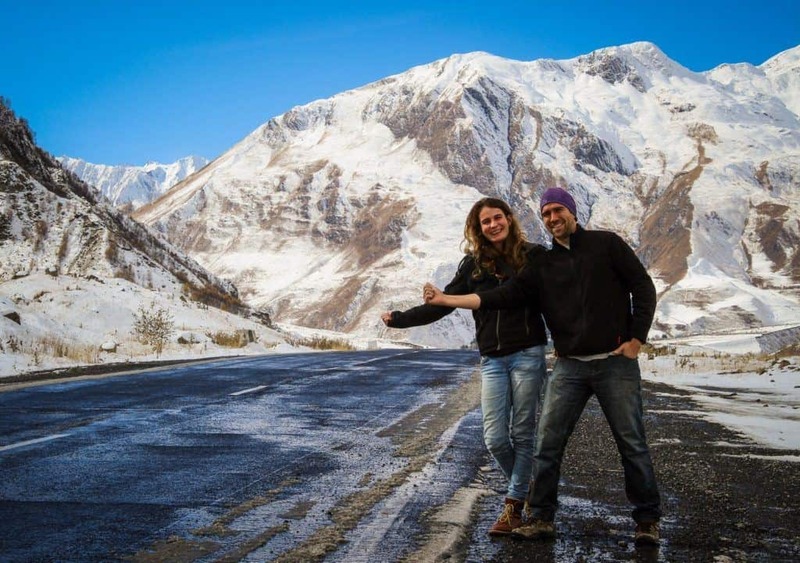 Check our guide on how to get from Bishkek to Almaty. If you are coming from Astana by car, the journey will be a bit longer – around 17 hours driving south on the highway M-36. You can find more info and details about getting to Almaty in our Travel Guide to Kazakhstan. There is really only one place I can recommend when it comes to staying in Almaty and that is the “European” backpackers hostel. We were supposed to stay there for 4 days last year and we ended up staying for more than a month. The owner’s kindness and his vast knowledge of all the things to do around Almaty is one of the reasons why we stayed there for so long. The location of this hostel couldn’t be better as it’s located 2 minutes from the Dostyk Plaza shopping mall, right in the city center and next to all the major bus stops that will bring you to the hiking trails I cover in this article. The place also has a beautiful garden where you can enjoy a barbecue with other travelers in summer and/or pitch your tent. 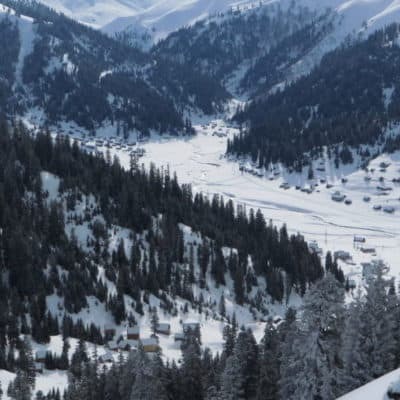 Shymbulak is 21 km away from the hostel and the nearest airport is Almaty International Airport, located just 17 km from the property. Click here to check out rates and availability for “European” backpackers hostel. If you rather stay at a guesthouse in Almaty, you’ll also have a lot of options. There are plenty of stunning hiking trails around Almaty. Most of them can be done within a day. It’s also possible to camp along the trails if you want to spend the night in the mountains. 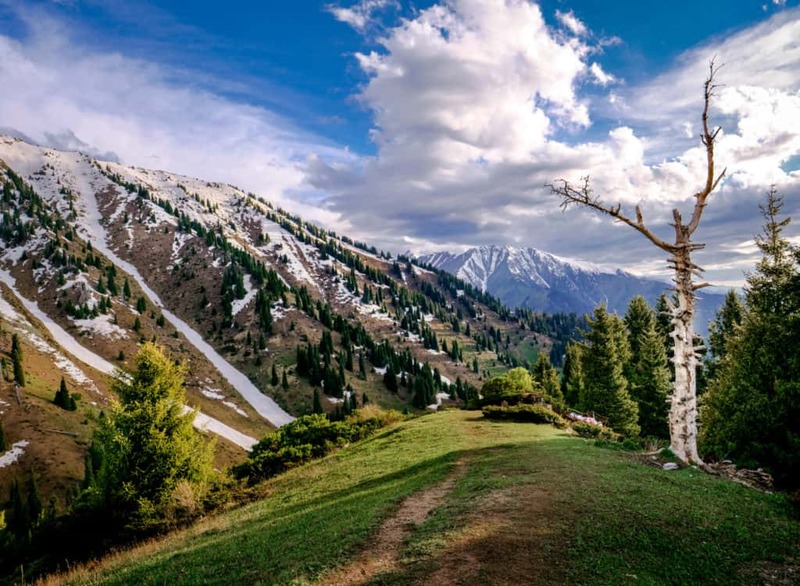 The starting point of these hikes can easily be reached by taking a bus from the city center of Almaty, which makes them the perfect escape from the urban environment. 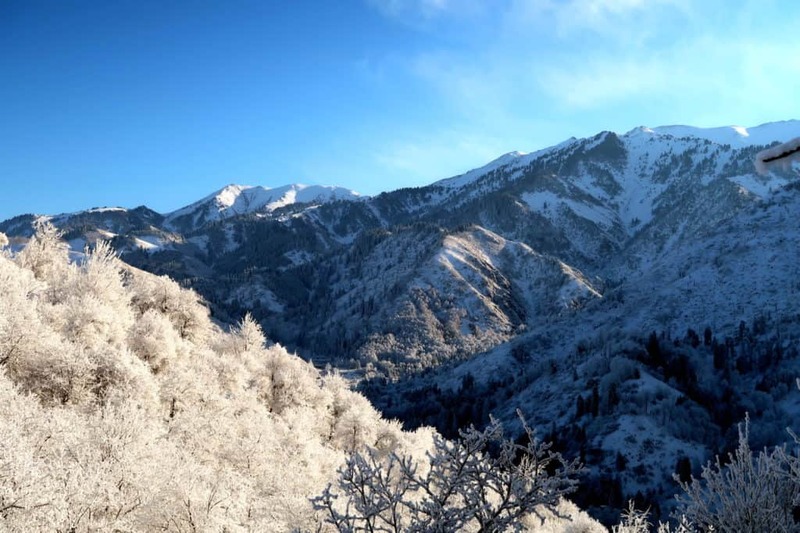 Here’s an overview of what I consider to be the best day hikes near Almaty. The trailhead of the Kok Zhailau – Three Brothers – Peak Kumbel trek is easily reached by taking bus number 12 in front of Dostyk Plaza or at the bus stop across from Hotel Kazakhstan. This bus goes in the direction of the Medeu skating rink but you have to get off at the bus stop named ”Prosveshchenets”, about 2 kilometers before Medeu (ask the bus driver to drop you off there). The beginning of the trek is on the right side of the bus stop. You’ll see a small road that goes towards the mountains. This road takes you across a small group of houses and you’ll have to follow it until the pavement disappears and the road turns to dirt. There you’ll reach another small group of houses and you’ll see a sign between two fences that marks the beginning of the trail. Kok Zhailau is the first part of the trek. It means green pasture in Kazakh and is a large open meadow located at an altitude of 2251 meters. The first part of the trail is quite steep and it takes you through a beautiful apple orchard. After an hour of strenuous hiking, the inclination of the trail becomes more moderate and less challenging. 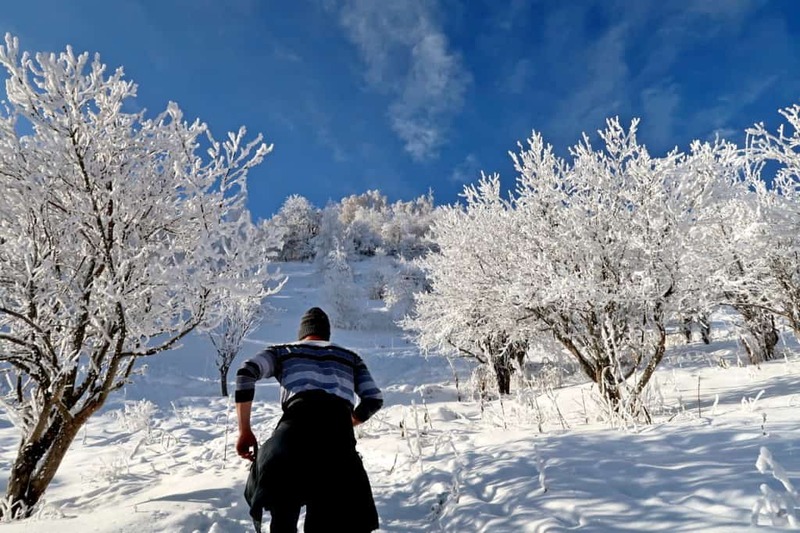 After another hour of walking, you’ll reach the beautiful alpine meadow of Kok Zhailau. If the weather is not too cloudy, you should have a fantastic view of Almaty from up here. It’s the ideal place for a nap before continuing towards the “Three Brothers” peak. These green pastures are also home to a wide variety of plants and animal species and a great place to pitch your tent. The ideal time to camp here is between May and September as the temperature at night rarely goes below 10ºC at this altitude. Kok Zhailau can be the end destination of your hike or you can also continue towards the southeastern part along a well-marked path to a nearby peak called Three Brothers. This peak, standing at about 3400 meters, is visible from Kok Zhailau. Its name comes from the three huge rocks standing on top of a ridge overlooking the plateau underneath. The path to get to the Three Brothers is quite steep so it’s worth it to take a small break at Kok Zhailau before continuing the ascent. Check out the video in which my brother and I attempted to hike all the way to the Three Brothers Peak during winter to see just how steep it was!! The Three Brothers are located on the western flank of Peak Kumbel. If you still have some energy left, you can follow the trail from the Three Brothers eastward along the ridge to reach the summit of Peak Kumbel. Once you’ve reached Peak Kumbel, you have 3 options to hike back. The first and most obvious one is to take the same way you came from. A second option is to walk back to Kok Zhailau and from there take the trail that goes west. This route is very interesting as it’s not so steep and offers some superb scenic views. This path will bring you to the last bus stop in the Almarasan valley where you can take the bus back to Almaty. It’s also not too far from Tau Spa, which is the perfect place to relax after a long day of hiking. A third option is to continue along the northeast ridge from Peak Kumbel. This trail will lead you to the dam above Medeu just underneath Peak Shymbulak, the ideal destination for skiing in Kazakhstan. From there it’s easy to catch a bus back to Almaty. However, this path goes through an avalanche area so it can be highly dangerous to walk here during the winter. 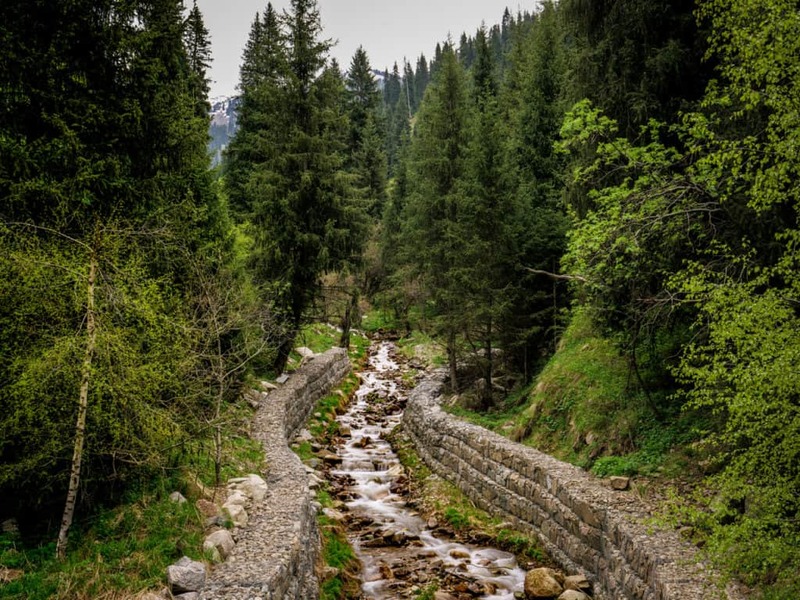 This is by far my favorite hike near Almaty and is fun to walk all year round. You walk along a beautiful river carrying the melting snow in the spring and the beginning of the trail crosses through an orchard full of apples in the fall. Beautiful flowers can be found all along the path during summer and this area is one of the best in the country for backcountry skiing in winter. This trail is also a great one to become more acquainted with the Kazakh mountains as it isn’t really challenging. It is popular with foreigners as well as with locals as there are no entrance fees and the trailhead is located near the Medeu bus stop. Although being an easy walk without any technical difficulties, it’s a long hike (14 km) and it will require a whole day for you to reach the summit of Mount Panorama and hike back to the base of the trail. So it’s important to start this trek early if you want to be back before dusk. In this video you can see how Cynthia and I almost reached peak Furmanova in one day. To get there from Almaty, you’ll need to take bus 12 from Dostyk Plaza or from the bus stop in front of Hotel Kazakhstan and ride the bus until you arrive at the Medeu skating rink. From there, you have to take the road that heads east below the parking lot. This road runs parallel to a small water canal and after following it for about half an hour you will see a sign on your left leading to the Kim-Asar Waterfalls – I cover this hike a bit farther in this article. If you stick to the main road and continue following it, it will turn into a dirt road as it enters a forest of pine trees. The trailhead is located here at an altitude of 1800 meters. It’s possible to park your car at the entrance of the path if you have your own vehicle. From there the trail will climb gently and cross a river. Families can be found here having a picnic during summer. After you pass the river, the path will become a bit steeper as you walk through an apple orchard. Continue climbing for a while and the path will open on a wide valley. We suggest you watch this video in which we walk along the same trail. Once you reach this valley, the trail will go towards a ridge on your left. From the top of this ridge, you will already be able to see peak Furmanova. Continuing in the direction of the peak, you will first come across an old Soviet ski lift and then a swing that was built on the ridge a few years ago. From this point on, the hills become steeper and steeper and will involve a bit of treacherous bouldering. 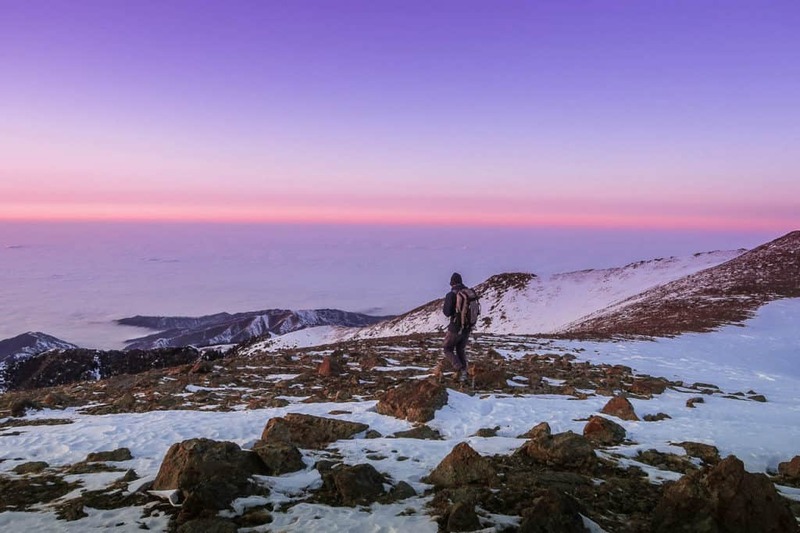 Peak Furmanova stands at an altitude of 3 029 meters and from here you will have an amazing view of the city of Almaty. If you continue following the path that goes up from there, you can reach the next peak where you’ll find a wooden bench that overlooks multiple valleys. Watch this video to see what those valleys look like from the top! This peak is called peak Panorama and I’m super happy I could reach it with my little brother in winter. Getting to the beginning of this trail is exactly the same as getting to the base of the Peak Furmanova hike. 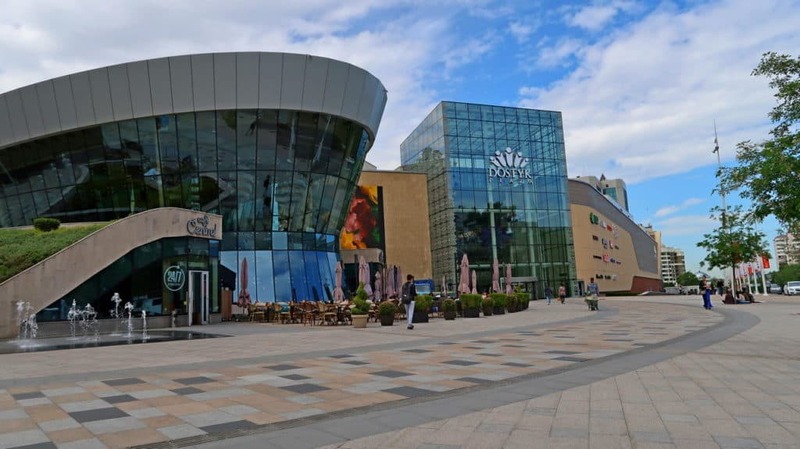 To get there you will need to take bus 12 from Dostyk Plaza or from the bus stop in front of Hotel Kazakhstan, ride the bus until you arrive at Medeu skating rink. From there take the road that heads east below the parking lot. This road runs parallel to a small water canal and after following it for about half an hour you will see a sign on your left leading to the Kim-Asar gorge and the Butakovka waterfalls. This is a wonderful day hike that will bring you along cascades and eventually to a 20-foot waterfall. It’s better to go there in the afternoon to admire the waterfall in the soft afternoon light. The cascades are really dramatic in June during the peak of the spring melts. In late summer and early fall, the flow of water slows down to a gentle trickle. 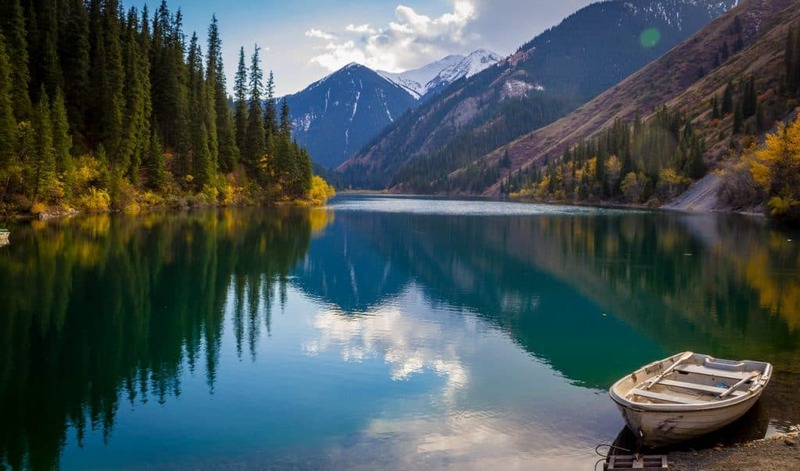 The Big Almaty Lake is truly the pearl of the Zailiskiy Alatau region. Located at an altitude of 2400 meters, this pristine lake is surrounded by some of the most gorgeous mountain peaks in the region. Although the lake itself is a beautiful attraction, the whole area around it offers tons of climbing, hiking and skiing opportunities. One thing to consider however is that Big Almaty Lake is located just 10 kilometers away from the border with Kyrgyzstan and this leads to different problems when it comes to visiting the area. Border guards have regular outposts around the lake and they are likely to ask for your passport so make sure you have it with you. Another situation to take into account is that the entrance fee to the park changes quite regularly. At some moments it is completely free to visit the park and at other times an entrance fee has to be paid. Make sure to check out this forum to stay up to date with current changes in the policy concerning Big Almaty Lake. Getting to the lake has gotten considerably easier in the last few years as the road leading to it is now completely paved and almost in perfect condition. This also makes it a popular weekend getaway for the locals, so make sure to avoid going there on those busy days. Getting to the entrance of the park from the city by public transport is fairly easy. You can take bus 28 at the corner of Al-Farabi and Navoi streets, next to the President’s Park and the last stop is just beyond the entrance to the park. However, if you want to avoid the hassle of finding the bus stop and then waiting for the bus itself, the best way is to go there by taxi. Our friend Megan wrote an excellent guide on taking taxis in Almaty, so make sure to read it to avoid being overcharged. Not only will be a lot cheaper if you are splitting the costs with a friend but it will also be a lot faster. You can order a Yandex taxi online or install the app directly on your phone. A taxi one-way to Big Almaty Lake should be around 3000 tenge, or $9-10. If you are using the Yandex app it is also possible to have the taxi wait for you at the lake or at the entrance of the park for an extra fee. The Kolsai Lakes are a system of three lakes, nestled among the hills of the Northern Tian Shan Mountains, approximately 300km east of Almaty. It’s not exactly near Almaty and it takes at least 6 hours to get there but if you have the time, you should definitely visit these lakes! 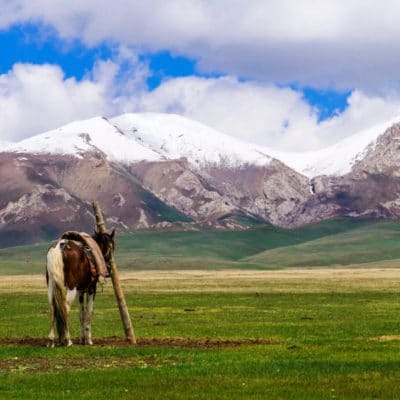 They are also called “The Pearl of the Northern Tian Shan” and we totally get why! The 3 lakes are so clear that, when the sun is out, the surrounding forests, hills and snowy mountain peaks are mirrored in the water. We loved our time hiking around these lakes and Kaindy lake so much that we dedicated a whole travel guide on hiking along the Kolsai Lakes and Kaindy lake and how to get there. When it comes to packing for a trek, it’s important to keep it as light as possible. Remember that you have to carry everything yourself and if you have ever done a 20 km hike that included climbing and ascending steep hills, you’ll know that there’s a big difference between carrying 10kg and hiking with 15kg on your back! Here is a list of what you need to bring with you when you want to go hiking for one day or a few days in the Zailiskiy Alatau mountains. If you’re not good at reading topographic maps, a hiking GPS can come in very useful when the path isn’t clear. We recommend the Garmin Foretrex Waterproof Hiking GPS. Check out its features here. Anti-diarrheal medicine – it’s definitely not much fun hiking when you got diarrhea! 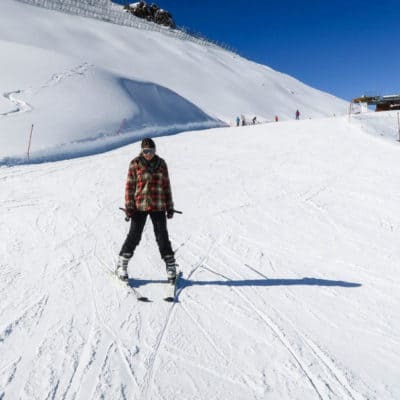 Altitude sickness pills – you’ll often find yourself at altitudes higher than 3000m. If you’re sensitive to high altitudes, these pills could help you. Please seek medical advice first. Here’s a great compact first-aid kit specially made for hiking, camping, trekking, and outdoor adventures. For more info, click here. You’ll find normal toilet paper in nearly every corner shop in Kazakhstan. However, if you want to be eco-friendly, I suggest you bring biodegradable toilet paper on your trek. It’ll be harder to find this type of toilet paper in a Kazakh shop so I suggest you buy it in advance in your local supermarket or order it here. This one seems to confuse a lot of people, why would you go on a hike to the mountains with a whistle?? Why on earth would you need a whistle in the wilderness? To make some music if the batteries of your iPod are dead? To annoy your trekking companion? To scare wild animals away? I found out how useful this could be at a very young age (my parents have a wilderness survival school in Canada). How small it might be, this whistle could save your life when you end up in an emergency situation – you’re lost or you fell and if for some reason you’re not able to use your emergency phone. You want to shout for help but your voice is lost in the wind. Blowing in a whistle is less tiring and the noise can be heard from miles away across the mountains. Any shepherds or other hikers who might be in the area will be able to hear you and locate your position by following the noise. An emergency survival whistle doesn’t have to cost much and definitely doesn’t take much space! We recommend this survival whistle. Having a good tent is very important! It has to shelter both you and your backpack from all the elements. Ideally, you have a lightweight one as some tents can be pretty heavy. We have the Quechua Quick Hiker Tent which weighs around 3 kg. It has been our house for the last three years and it’s still standing strong! If you’re looking for a smaller and/or lighter tent, we would also recommend the Nemo Dagger Ultralight Backpacking Tent. This tent weighs around 1.5kg and is ideal for 1 or 2 persons. Be kind to your feet because you’ll need them to bring you across the mountains! Choose comfortable hiking shoes that protect your feet from rocks and debris on the trail. The shoes should have a good grip, keep your feet dry and be light enough to move easily. I’m very happy with my leather hiking boots. I’d recommend hiking boots from the brand Columbia. If you are considering doing one of the small day hikes I mentioned in this article without staying overnight and camping then there is no need for a huge backpack. You will need a bag that is small yet sturdy enough to carry your food and snacks for the day. I recommend the Osprey Packs Hikelite 26 Backpack. If you want to spend a couple of days in the mountains, you should bring a proper trekking backpack. Having a good backpack to store all your stuff is, of course, a necessity. You need a light but strong bag that is capable of carrying a lot of weight but still sits comfortably on your back. Ideally, the backpack is made out of waterproof material and/or comes with a waterproof cover. The zippers need to be big and strong and the material very durable. When it comes to a good backpack, don’t try to save your budget and buy a cheap one. 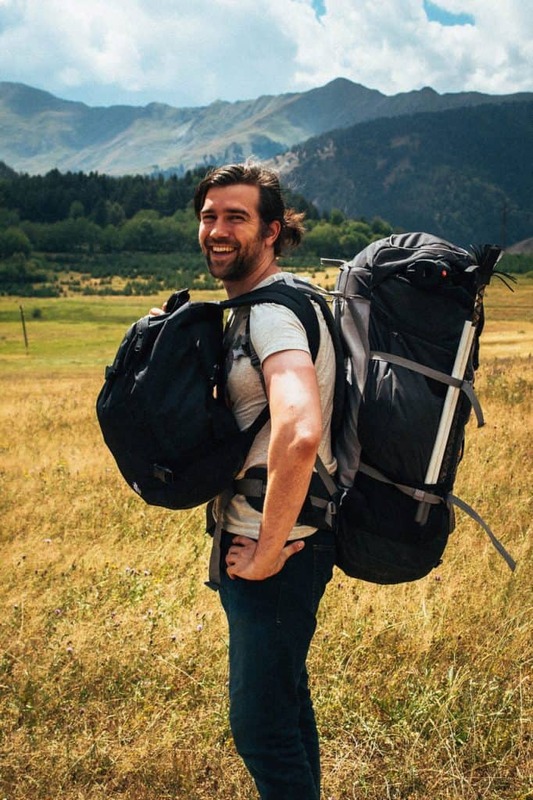 Remember that you’ll pay for the quality and the last thing you want is your backpack to break during the trek – what are you going to do with all of your stuff then? I have the Forclaz 90, which is a very good backpack! 90L might be a little too big for what you need (our backpacks are our home so we need big ones) but there are smaller ones, like the Forclaz 50. Cynthia is not too happy about her backpack. It’s an old one and even though it survived many years of backpacking and trekking, she often feels like a turtle with it (the shape is a bit odd). She wants to purchase a new one such as the Forclaz 70. Spending the night in the mountains is such a beautiful experience! If it’s a clear night, you’ll see thousands of stars! But unless it’s full moon, you’ll need a small but powerful flashlight to find your way around in the darkness. We recommend you use a headlamp so you have your hands free to cook, read, or walk around. Tip: Don’t go wandering too far from your tent at night. The terrain can be super treacherous in the dark. Apart from these very important items, we also suggest you bring a good sharp knife, a tent repair kit, food, and water. One question that we often hear from people preparing for a hike is “ How much food should I pack?” When thinking about how much food we should pack Cynthia and I always try to carry a bit more than what we actually need. We don’t overdo it but a rule of thumb is to always have a surplus of food to be prepared for any eventuality. It’s fine to have candy bars and fast sugars during a trip but for long hikes, it’s important to have proteins and complex carbohydrates. A good idea is to bring nuts and dry raisins. Although the food stores in Almaty are well stocked and offer the essentials such as nuts and dry fruits, they do lack dehydrated meals so it could be a good idea to buy those online before your trip to the backcountry. When you are out in the mountains exhausting yourself with full days of climbing, you want a meal that will strengthen you, revitalize you and hopefully taste really good. For that we recommend camping-freeze-dried-food. The advantage of this kind of food is that once the water is removed the meals become super light and you can carry large amounts of it. Apart from being light, these meals retain most of their nutritional qualities, shape and amazing taste. One great example is the delicious bag of Mountain House Beef Stroganoff with noodles. Apart from bringing the quantity of food needed for your trip, it’s very important to consider how much fuel you will need to cook it if you bring a camping stove. 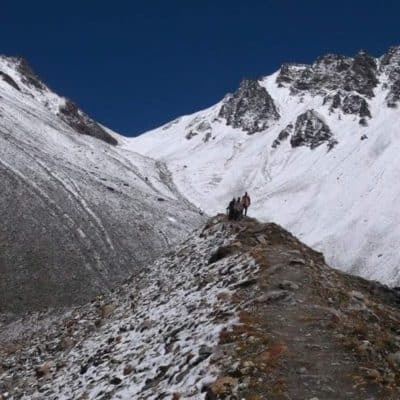 Trekking, skiing, and hiking can be fun activities open to anyone who has the right physical condition, however, they come with inherent risks and even more so in the high mountains of Central Asia. It’s important to be well prepared and follow some basic safety rules. One of the most important things to consider is to start your mountain adventure with the right equipment. 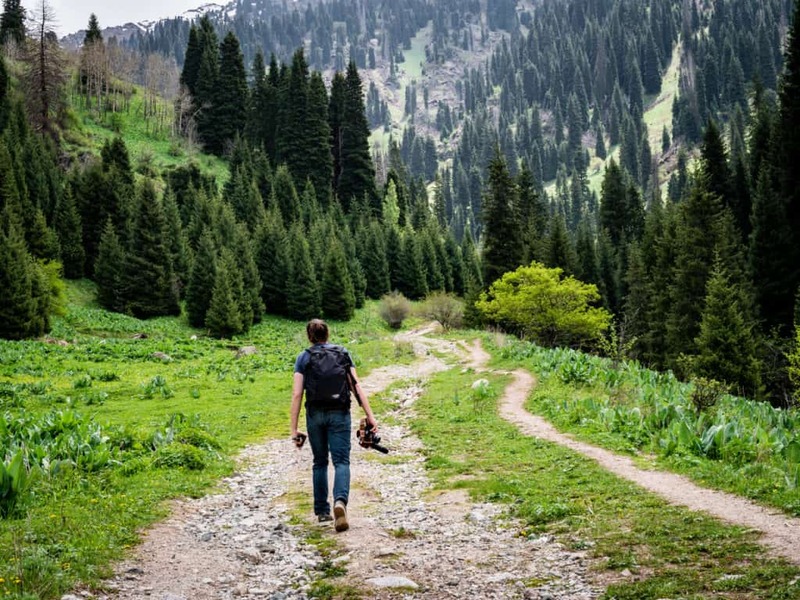 Since cell phone connection is not the best in the mountains around Almaty, it’s very important to let a friend know you will be leaving and for how long you will be gone. 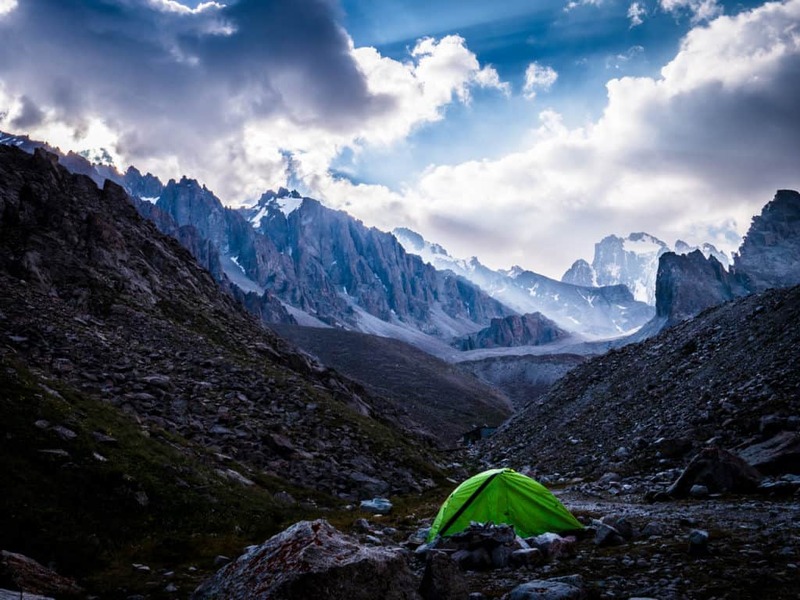 Some hiking trails of the Tian Shan mountains are very remote so another very important thing to consider is to bring a personal locator beacon and leave one at your hostel or hotel in Almaty. 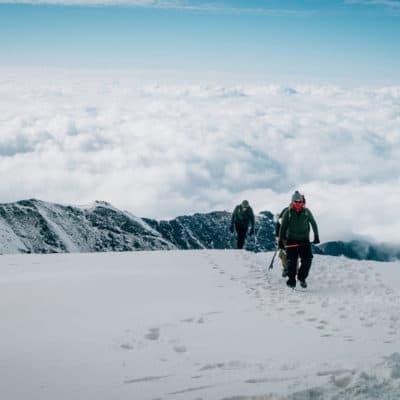 It would be almost impossible to count on any meaningful help if you would get lost or injured during your trek if you are completely alone or without means of communication so always consider hiking with an experienced partner who knows the mountains. The mild weather of the Zailiskiy Alatau mountains makes this region a prime hiking destination between the months of May and September. 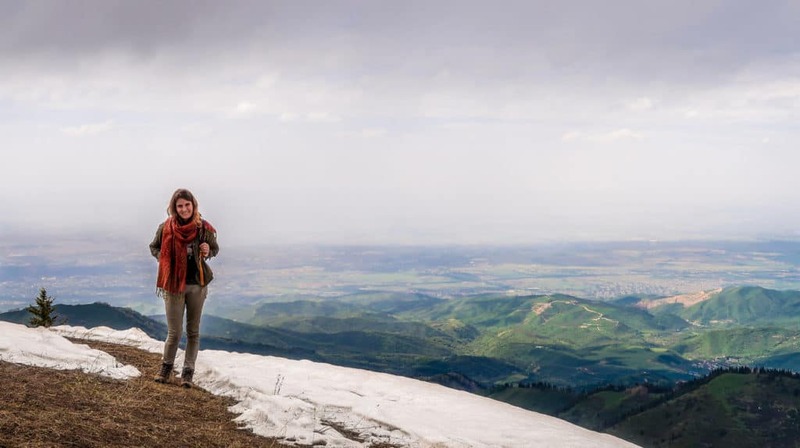 The beginning of Summer ( May and June ) is quite rainy in the mountains surrounding Almaty and the weather can change very quickly so it’s worth packing a raincoat, waterproof boots, some good warm gloves, and a hat. Although the weather in Almaty might be beautiful and sunny, remember that this might not be the situation in the mountains. It’s better to check the weather forecast for the particular peak or area in which you will be hiking. 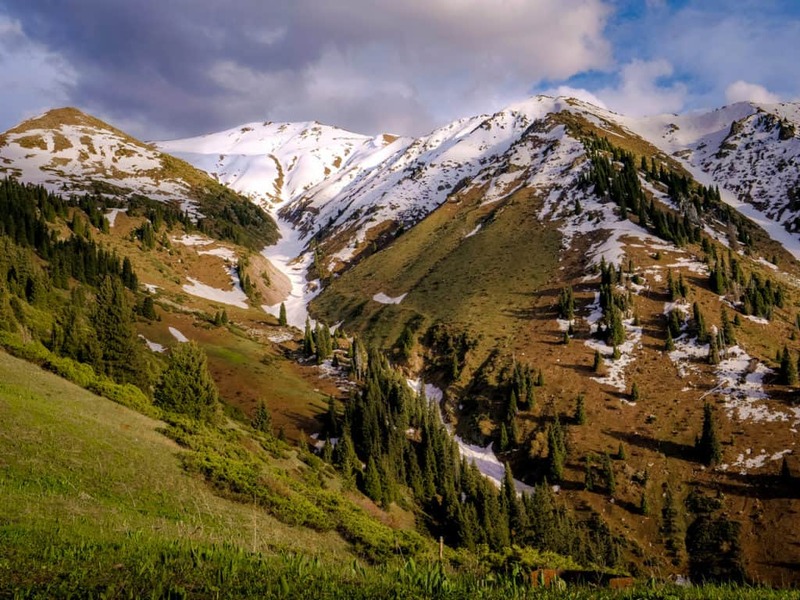 July is usually the perfect month to hike in Kazakhstan and the ski season is between October and March at Shymbulak. The mountains around Almaty also present serious avalanche danger, especially between the months of April and June but the hikes I included in this guide won’t expose you to the risk these avalanches represent. Make sure to always stick to the path. Different water-related illnesses can also be a problem in these mountains so it’s important to boil or filter all water prior to drinking it. A great solution can be a water bottle with an integrated filter or some water purifying tablets. Mosquitoes are never really problems in these mountains but ticks are encountered in the lower valleys until August. 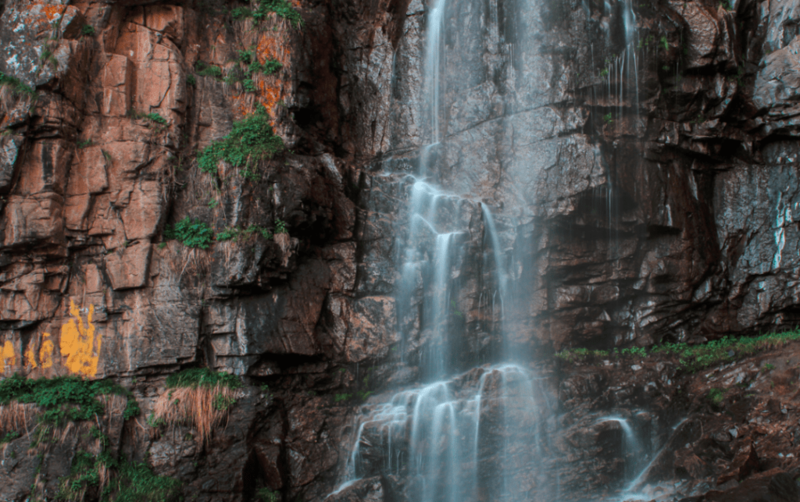 The Kim-Asar gorge hike I wrote about in this guide is a place where ticks are quite prevalent during summer so it’s important to take good precautions to prevent tick bites. The risk of getting Lyme disease is bigger the longer a tick is attached, so a good habit is to do a regular tick check throughout the day. Altitude sickness can be another common problem when hiking around Almaty as some of the mountain trails are quite high. Due to the limited health care available in Almaty, it’s very important to take the proper time to acclimatize. The beautiful alpine meadow of Kok Zhailau is a great place to spend a few days before continuing towards higher peaks. If you need medical attention at any point either before your hike of after in Almaty, we highly recommend SOS international clinic. Their service will be more expensive than in other clinics in Almaty but having the assistance of well-formed English speaking doctors makes it totally worth the price. If you need to buy bandages, gauze or other medical items for your hike to the mountains, you will be able to find well-stocked pharmacies all around the city. Don’t forget to get a good and reliable travel insurance! We recommend World Nomads. 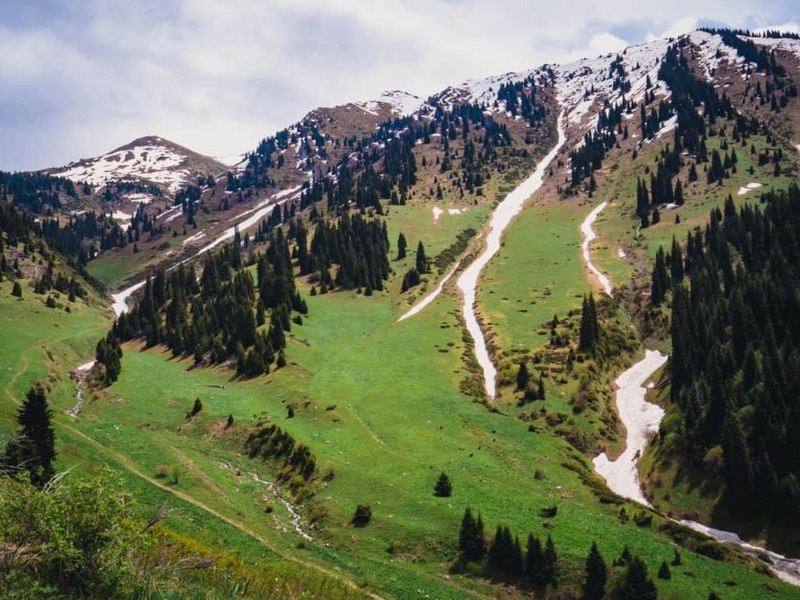 I hope this guide is useful and that you enjoy the pristine Tain Shan mountains near Almaty as much as we did! 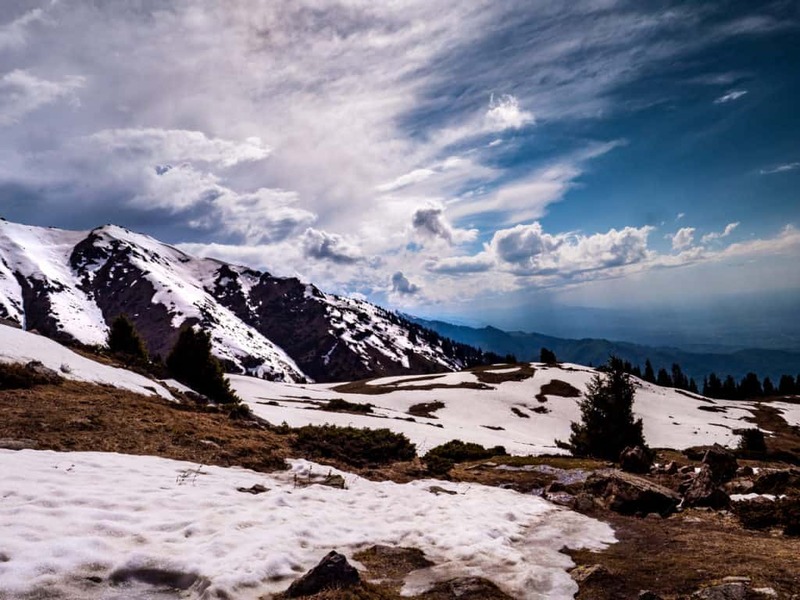 We always love to hear from you so if you have any questions or recommendations yourself concerning hiking near Almaty, get in touch or let us know in the comments below! Visiting the ship graveyard of Aral, the lost sea of Central Asia.